I was getting magazines loaded up to take my 941F shooting and I noticed something kind of odd. The factory magazines that came with my full sized steel framed Witness Classic (small frame) won't lock in the 941F. They just won't go up far enough in the magazine well. Funny, my Jericho takes Tanfo mags right out of the bag, but I have to modify Mecgars. Take the mag body which works and line it up next to the one that doesn't; a little dremel work on the mag release slots and you're in business. The only negative that I can think of about the trigger was that it was a little rough as it was being reset. I bought a factory hammer and trigger out of a CZ75 Tactical Sport directly from CZ for $44 + shipping (the plastic trigger is only $9!) and with a few small mods put them in my Jericho. With a 13# hammer spring it sports a sweet 2 1/4# trigger pull. I found some M3 allen set screws at my hardware store for $.09 each for pretravel and overtravel. The mods were: drill pinholes to fit, and custom fit the slot in the back of the trigger to trigger bar linkage. The TS trigger is awesome! don't hate, immitate! There were no Single Action only models. The Frame Mounted Safety models are a bit rare and very desirable. When you find one, grab it! Hi, yes there are single action only models. Maybe not available to the public (for whatever obscure reason) even in Israel, but they do exit. I carried one for year as an Israel Police Force Officer. They are all nickel or something. Not black. I don't have it anymore. I quit the force. Will try to find a picture. GolaniGC, welcome to the forum. The single action 941F that I received is black. Definitely post a picture if you can find one. I'll try to find a picture. I'm pretty sure the safety was frame mounted. I quit the force 15 years ago and of course returned the gun. It's not mine, but it's exactly the same. Although I'm more of a 1911 aficionado, I loved this gun!!! Sturdy and heavy piece of hardware. Built for combat. The black plastic in front of the trigger guard is removable. It's held by a screw. I removed mine at the time. Nice pistol. It looks just like mine except that mine is black. Does yours have the black plastic thing in front of the trigger guard and a lanyard loop? No, it didn't come with that. Do you have a pict? Not right now, but I can take one later. None were imported to the USA thru the regular Importer, Magnum Research. 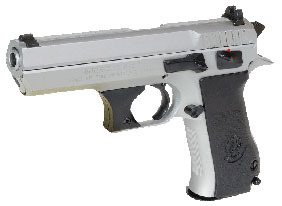 What is more likely that this particular Single Action Jericho 941F was imported as surplus from from one of the Israeli Gun Club Armories, thru a Surplus Importer that has been importing the various surplus Tanfoglio Pistols. Charles Daly, Inc. may also have imported some, just before they went under, but info on their activities is scarce at best and this is speculation on my part. I hear you. No sweat. But over here we're only allowed one handgun only, and it's hard to get a license. Since I already carry a 1911 (GCNM), I would have to give it up to buy another gun. Update: I found some documentation that shows the single action only trigger was a factory option. It's hard to see, but look towards the bottom of the second page under options. That 941FS is a spitting image of my Canik55 T-100 that I purchased a month ago. Have you ever seen a statue honoring someone who left well enough alone? A clone of a clone of a clone of a CZ75!